Known by many nicknames such as “The First City,” “The Rain Capital of Alaska” and “The Salmon Capital of the World,” the town’s name originates from the name “Kitschk-hin” (“Thundering Wings of an Eagle”), the designation the native Tlingit people gave to the historical salmon camp creek that runs through part of contemporary downtown. Steady interest in the area’s plentiful fish and timber resources prompted Mike Martin to purchase 160 acres from Tlingit Chief Kyan in 1885, with the city incorporating in 1900. 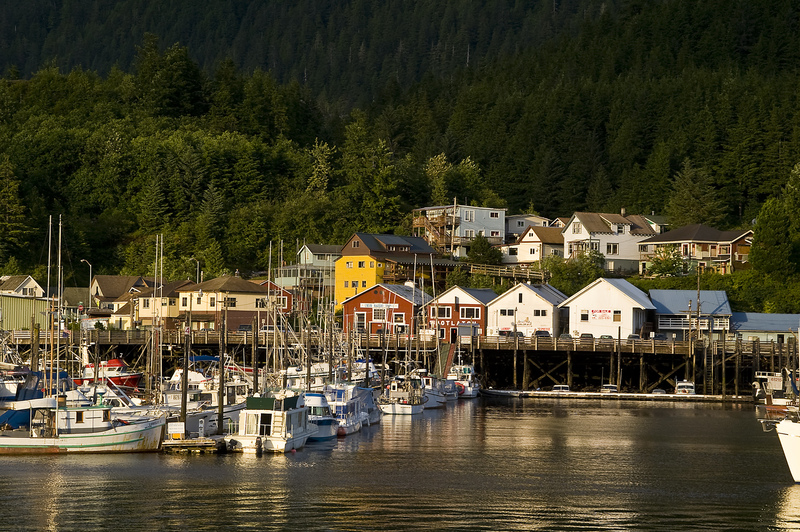 Now, the city is the fifth-most populous in Alaska with a population of 8,119 in 2011 (13,779 in the Ketchikan Gateway Borough, according to the 2012 Census). Ketchikan is governed by Mayor Lew Williams III and an elected City Council. The Ketchikan Gateway Borough School District is composed of five elementary schools (Fawn Mountain Elementary, Houghtaling, Ketchikan Charter, Point Higgins Elementary and Tongass School of Arts & Sciences), a middle school (Schoenbar Middle School) and two high schools (Ketchikan High and Revilla Junior/Senior High). There is also an extended campus of the University of Alaska Southeast. Click here to check out live webcam images of Ketchikan!